Three sports in one! This camp is for individuals who wish to improve their tennis skills and play friendly matches with others. 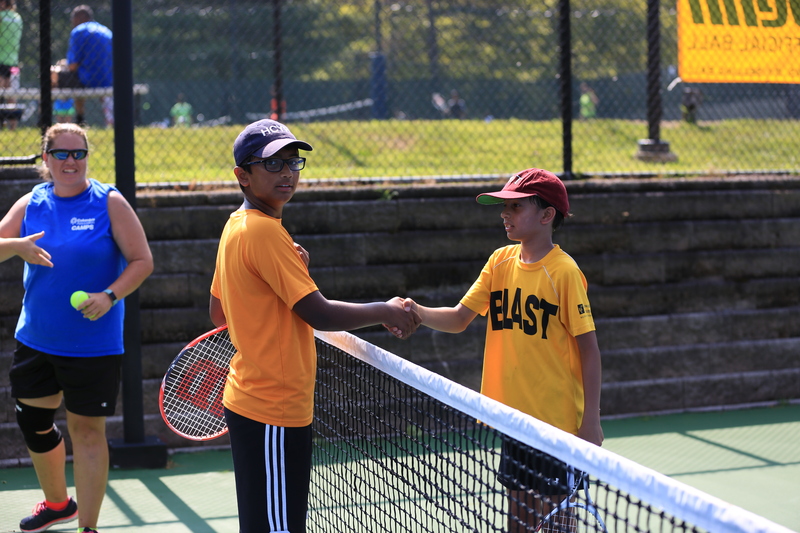 Campers should have previous tennis experience from attending clinics, previous tennis camps or through their school. The tennis program is led by Columbia Association’s certified tennis professionals and a team of trained camp staff who are equipped with experience developing junior tennis players. The mission of the tennis portion is to provide a highly organized, active and energetic environment featuring a Rally and Play, game-based approach. It focuses on dynamic warm-ups and specific themes with appropriate drills emphasizing tactical and technical development. Awards are given out at the end of each session. The golfing portion is for beginning golfers who will learn the basics of golf on the driving range and putting greens. Here they will acquire the basics of chipping, pitching and sand play, eventually mastering a full swing. After several segments of drills, campers cool down with recreational swimming. All activities take place right at Hobbit’s Glen. Golf equipment is supplied, but campers must supply their own racket. Two separate two-week sessions – Click here to see a sample camp schedule.